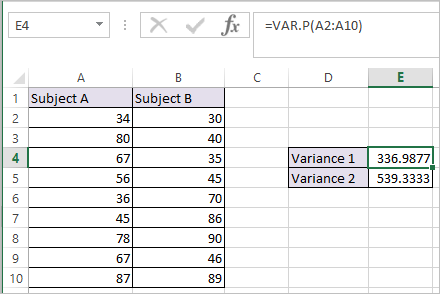 In this tutorial we will learn how to perform Z Test in Excel. When we want to compare two means when variance are known, then we use Z Test. 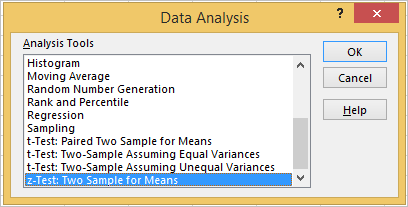 Z Test is the test of null hypothesis, which states the mean of two population are equal. 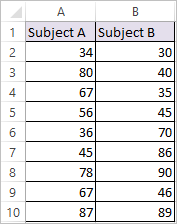 We will be using the scores of students across two different subjects to depict example on Z test in Excel, Which is shown below. If z < – z Critical two-tail or z Stat > z Critical two-tail, we reject the null hypothesis. In our case 0.213 > -1.959 and 0.213 < 1.959, so we cannot reject null hypothesis. So both the means do not differ significantly.